Windows 7 finally gives you the opportunity to customize the contents of the notification area of the taskbar. The notification area is the glob of icons down near the clock that used to be known as the system tray. If you’re tired of seeing a useless icon in the notification area — or if you know that you want to see an icon there all the time — you can now do something about it. 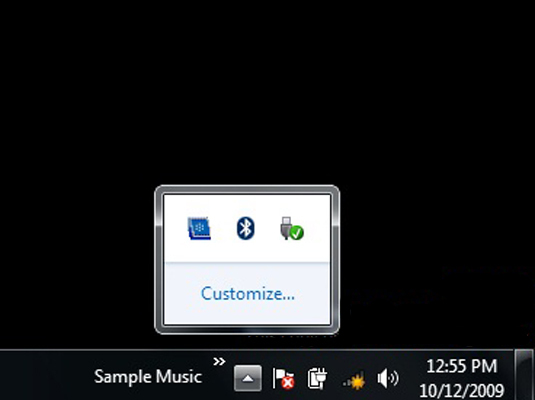 By default, Windows 7 only uses a small handful of visible notification icons — primarily for the Action Center, the Network Center, and the master audio volume control slider. Additional icons are probably either courtesy of your computer’s manufacturer or the result of installing a new program. The notification area is used to let you know when a program has a message for you. But a lot of program icons appear in the notification area just to tell you that they’re running. With the changes in the taskbar, there really is no need to include icons there just because a program is running. You can choose to remove an icon all the time or have it display only when there are messages. Click the up arrow at the left edge of the icons. 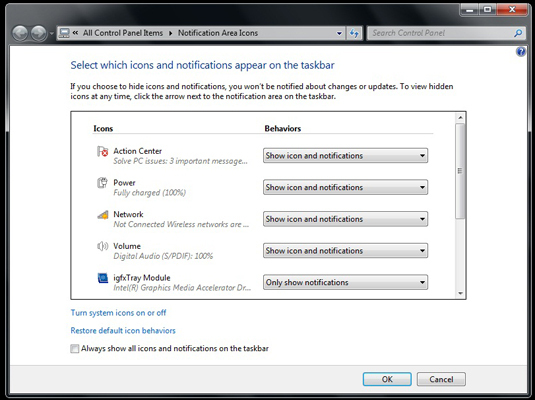 Windows 7 will show you a list of all the current notification area icons. (Optional) Move any icon down near the clock to ensure that it will always be visible. There is only a limited amount of visible space to display the icons, so moving it tells Windows 7 that you want to give this icon display priority. If you later change your mind, you can click and drag the icon back from the notification area into the box. Windows shows you an options dialog box for the Notification Area. Find the icon you want to zap and, in the drop-down box, and choose Hide Icon and Notifications (to turn off the beast completely). You could also choose Only Show Notifications to hide the icon and only show you notifications (the balloon warnings) when there’s a problem. The icon changes its wayward ways immediately.